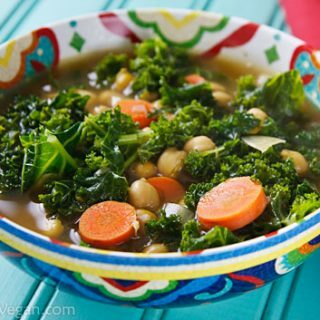 This richly spiced kale soup, redolent of cinnamon, saffron, and ginger, is as delicious as it is good-for-you. Two words: TRY IT. If it seems to you like I’ve been making lots of soup lately, you’re right. Not that it’s been especially cool here, but once there’s even a hint of Fall nip in the air, I crave nothing more than a hot bowl of soup. I haven’t wanted to even glimpse a salad; give me all my veggies immersed in a comforting bowl of broth! I firmly believe that simmering in soup is one of the healthiest ways to cook vegetables. Unlike boiling or even steaming, to a certain extent, all of the nutrients remain in the broth to be eaten along with the vegetables. And did you know that cooking actually increases the nutrients available in some vegetables, including carrots? Lightly cooking carrots breaks down the cell walls, increasing the amount of absorbable beta carotene. This particular soup is a nutritional powerhouse. The carrots provide beta carotene, the chickpeas offer protein, and the kale…well the kale is a powerhouse all on its own. It’s rich in Vitamin A, Vitamin C, Vitamin K, Vitamin B6, potassium, copper, manganese, and calcium. Plus, it’s one of the cruciferous vegetables proven to reduce the risk of a number of cancers as well as heart disease. Eat more kale! 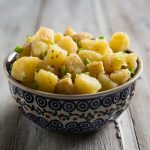 But don’t try this recipe because it’s good for you; try it because it’s delicious: sumptuously seasoned with cumin, saffron, cinnamon, ginger, and allspice, yet not overwhelming or hot-pepper spicy. And I hesitate to say this because I know my daughter’s tastes aren’t always in line with other 10-year-olds’, but she couldn’t get enough of it, even though her first look made her go, “Yuck.” But after the first bite, she was draining the entire bowl. We all were. I count this one among my family’s favorite recipes. Do yourself a favor and give it a try! Okay, I made up the North African part. This seasoning combination is of my own devising, but it conjures up images of Morocco, Tunisia, and Egypt in my imagination. If you can get saffron, please use it. It offers a unique flavor that there’s just no substitute for. Heat a large saucepan or Dutch oven. Add the onion and carrot and cook over medium-high heat until the onion begins to brown (about 5 minutes). Add the garlic and cook for 1 more minute. Add the spices, including bay leaves and cinnamon stick, and cook, stirring, for another minute. Add the chickpeas and stir to coat them with the spices. Pour in the 8 cups of vegetable stock, bring to a boil, and reduce heat to a simmer for 20 minutes. Add the chopped kale and stir. If necessary add water to cover the kale and cook until it is tender, about 10-25 minutes, depending on how cooked you like your kale. Check frequently to see if it is becoming dry and add water as needed. Add salt to taste and serve. For a delicious one-pot meal, add a half cup of uncooked quinoa with the vegetable stock. Under the new Weight Watcher’s Freestyle plan, this soup has zero smart points, as long as you use a low-calorie broth. If you add the optional quinoa, it’s 2 smart points per serving. Delicious soup. I cut the kale down to about 3 cups, and didn’t need the extra water, since I have a tough time digesting too many greens. It still came out great! I have loved your site since my husband and I went vegan in June of 2011. My success rate with your recipes far exceeds that with any of my dozen vegan cookbooks. This is my first attempt at trying kale and thanks to this delicious and wonderful recipe, I am now a kale fan. I made it exactly per directions. 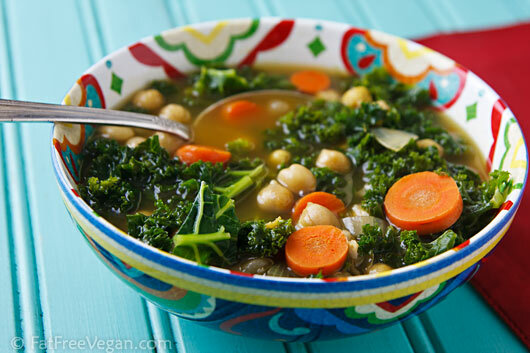 I am still not crazy about chickpeas, but this soup is so good that I hardly notice them anyway. 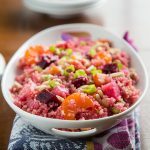 I have a feeling this recipe will make it onto our regular dinner rotation menu. Thanks for this recipe and thanks for this site! Eating it now and it is very delish! I need to buy saffron because I do not have any and I had no stock so I used miso paste so I did make a few changes, but still really good. Thanks! This was really really nice. My husband asked to add rice next time (even though I added some of the quinoa) BUT, as is… it brought me back to the trip I took to Morocco a few years ago. Good call. This is possibly my favorite soup of all time, and I am a soup fiend. That is all. This soup is delicious. It will also become one of our favorites. I really need to thank you for all your work on this site. Every one of your recipes that I have made are delicious, and I especially love the smoked spices you suggest, they really make a huge difference in taste. One thing I notice with the soups, is that your serving sizes seem especially large. Am I adding too much? It seems like my 6 quart Lodge Dutch oven (looks to be the same one in your okra sweet potato recipe) is about 3/4 or so full when I am done. Is that about right- serving sizes are about 2+ cups? Thanks. Hi Adeline, I use large soup bowls and serve soups as the main dish (often the only dish of a one-pot meal), so 2 cups per serving is probably about right. I like the soups fairly thick and don’t add too much extra water or broth. Oh, Susan! I just made this soup for the first time and I proceeded to STUFF myself. Exotic spices but not over spiced. And I didn’t expect to be able to taste the saffron in all that other stuff, but it really does add an unexpected delight. This is about to be a standard go-to. Easy and sooo delish! Especially now that saffron has been added to my pantry. Thanks again! WOW! This soup was amazing! Made two pots last week and going to make again this week! Didn’t change anything in the recipe. One person here commented it was flat tasting??? Try adding salt. Veggie broth can be very low in sodium depending which one you buy and salt is a must as long as your’re not trying to cut back. Susan, I can’t tell you how much this blog has helped me become vegan. Every recipe I’ve made from here has been fantastic! Keep up the fantastic job you do here you are a wiz in the kitchen!! Thank you! I must admit, i was a bit unsure about this recipe…had most of the ingredients in my fridge and wanted to make something easy for a rainy sunday afternoon. I eased on the veggie stock (sodium) and mixed in more water. Loved the ease of making, and even involved my little 4yr old in the cooking. Apart from a slight bitter after taste in the soup, invented the éat while you dance’ strategy and she managed to finished all her soup. Thank you for your hardwork in writing down all your recipes and actually keeping track of amounts etc., I am from the the nothing ever turns out the same twice school of cooking because I am too lazy to follow a recipe or write it down. I admire your dedication! This was so delicious. I thought about it early enough where I had enough time to use dried garbanzos. I did use kale but I also used chard as I didn’t think it equaled eight cups. (as you can tell I’m not so hot with the measuring ). It went really well with matzah. So, this is perfect for a meal during Passover. Amazing! Kale is my new favorite vegetable and I’ve been working my way through your kale recipes. The kale and tofu scramble and this soup are both really delicious. Thanks! i love this recipe so much but I’m really not feeling a hot soup in the summer. Any suggestions on how to modify it for summer cooking? Would leaving out the broth still be good? I feel like a lot of flavor is in the broth and doesn’t get terribly soaked up! Oh my goodness! Made this tonight and it is incredible!!! This may just become my go to cool weather soup. I added the quinoa, but didn’t have saffron. It is still heavenly! Can’t wait to make it again with saffron. Thanks for sharing. 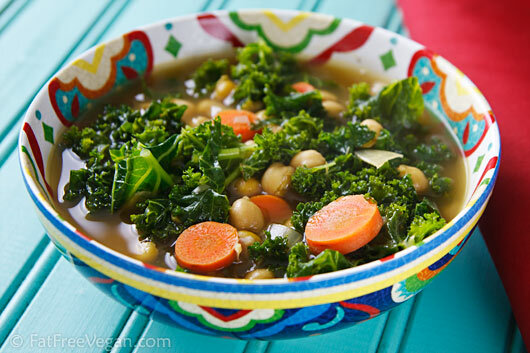 If you use a commercial vegetable broth, what brand do you find the best? I’m thinking this would make a big difference in the outcome of the soup? There are so many kinds and the prices vary a lot. Thanks! I’m looking forward to trying this. I use two kinds: Imagine’s No-Chicken broth in the liter container and Edward & Sons’ Not Chick’n bouillon cubes. Both of these taste better to me than any of the strictly vegetable broths. I can’t recall seeing those in the store, but I will look for them. I love your recipes! You’ve become the go-to website when I am looking for something new to try. Seriously, this is the best soup I have ever had. I was excited to find a soup that had greens in it, not your typical root vegetables as the main ingredient! I didn’t have chic peas so I replaced them with butter beans (and was out of saffron). Next time, I’ll try it with the chic peas. A scrumptous surprise!!! Super delicious even without saffron! I didn’t have any and am definitley planning on making this again with some. Susan, can you be more specific as to “generous pinch?” I’m going to order a gram of saffron – how many “pinches” do you think would be in a gram? This stuff is pricey! I get a lot of pinches out of my gram of saffron. I’ve never counted, but I would guess 15-20. Such a delicious recipe. Perfect for winter. Cheers! I made this last night and it is amazing! I can’t describe how yummy the broth is. Bravo! This soup was amazing! We could not stop eating it. It is so flavorful. Even the kids had two bowls. We can’t buy kale year round where I live only in Nov and Dec (counting down the days to eat a raw kale salad). I can buy frozen kale when it is in stock. So I’ve been trying to find great recipes to add the frozen kale to. This was perfect. This looks delicious, and I just got some kale at the local farmers’ market. I think I’ll add barley instead of quinoa. I love the flavor of barley. I am 62 years old. I am to learn cooking also. So I am reading whatever is nutritious. I am from India. And Indians have typical food structure. I am moving towards Salads and Soups. So this brings richness in my life. Thanking you for promoting Foods and Health. May God Bless You With Joys and Progress. Can u clarify the amount of time CANNED chickpeas need to be cooked? I followed your recipe exactly as written and my canned chickpeas fell apart and got mushy. It didn’t taste good at all. 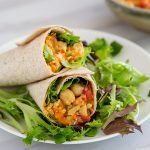 Have you yourself ever used canned chickpeas? 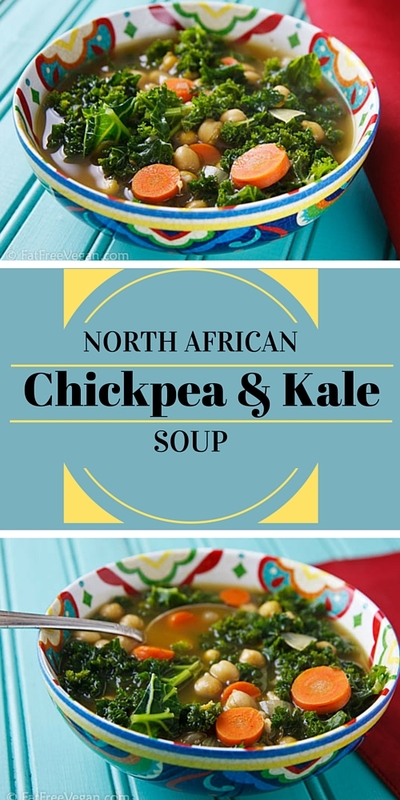 I always use canned chickpeas, and coincidentally I’m cooking this soup right now. Your canned chickpeas must be very different from mine because I’ve never had them get mushy in anything. In fact, they sometimes border on being too tough. I’m really sorry your soup came out bad, but please consider trying a different brand of chickpeas. Or, it could be that you just got a bad batch from a normally good brand. I’ve truly never heard of canned chickpeas getting mushy. 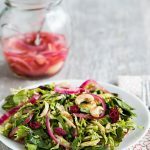 I posted my recipe on Sparkpeople, but I linked back to here in the description so that everyone will know where it came from …. If you don’t want that, though, I can try to take it (the recipe) down. I’m so glad I gave this recipe a try. This is one of our favorites. The only change I make now is to up the veggies and decrease the chickpeas so it’s more of an accompaniment rather than a meal on its own. We made this last night. OMG it was DELICIOUS! And so simple. I did not have any quinoa (how could that happen?) so added a little couscous, but besides that teeny change I followed the recipe. Really, really good. Saw your post on Facebook and made this tonight. Delicious! Had planned to wait until I get bay leaves and saffron but I needed a dinner plan tonight and had everything else. I used pressure-cooked chickpeas so added extra salt to compensate and also used 1/2 tsp of cayenne. Otherwise followed the recipe, including 8 cups of kale. Could have used even more kale as your recipe suggests but I decided to use freshly blanched kale when we eat the leftovers tomorrow. Used Bryanna Clark Grogan’s homemade chicken-style veggie broth (recipe on her blog) for the first time with success. Hubby loved it tho’ did ask for a spritz of lemon as he’s new to soups with sweeter spices like cinnamon & allspice. But by the end he was asking me what modifications I made to the recipe so he will know what to do when he makes it! Will definitely make again and next time add bay leaves & saffron as per your recipe! If I run out of cinnamon sticks do you think I could substitute a very small amount of ground cinnamon? WOW….is all I’m going to say! I made this following the recipe exactly, and it’s amazing. The only deviation I made, wasn’t really a deviation: I used Lacinato Kale, because that’s my favorite variety and I always have it on hand. My 11 year old son loved this soup as well. You see and feel the good coming in with every spoonful! Found saffron inexpensively in the Latin American section! This is an amazing recipe! I’ve made it many times and now that the weather is warmer, I cut the carrots out and turned it into a salad with barley and quinoa. So good and filling! My picky eater loves it too!